The people at the University of Kursk in Russia have found an improved method in the use of GHK. They used Gly-His-Lys (0.5 μg/kg), dalargin (1.2 μg/kg) (an opioid-like synthetic drug) and and biological peptide thymogen (0.5 μg/kg) (dipeptide,L-glutamyl-L-tryptophan) to heal bones. The total peptide dosage is about 2 micrograms per KG or about 140 micrograms in a human. 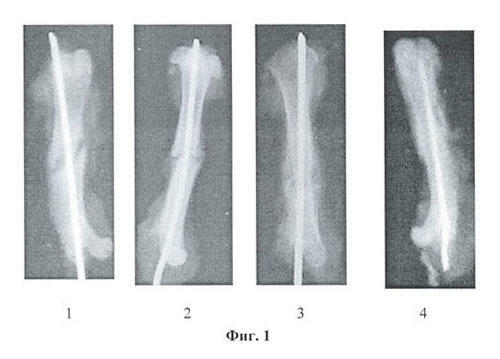 It has been established, that in case of experimental rat bone fractures the intraperitoneally injections of peptides in equimolar doses – Gly-His-Lys (0.5 μg/kg), dalargin (1.2 μg/kg) and thymogen (0.5 μg/kg) during 10 days result in their antioxidant actions testified by the decrease of malonic dialdehyde concentration and increase of catalase activity in blood. The effect of thymogen on the level of malonic dialdehyde was more expressed in comparison with Gly-His-Lys action. The peptides had synergetic and reparative action because in case of twin combined injections of these substances the essential amplification of antioxidant (catalase activity) and reparative effects was observed in comparison with individual injections of peptides. The more expressed reparative changes were found in the group of rats with peptide combined injection Gly-His-Lys + dalargin testifyed by histological and X-ray investigations. In animals of this group the line of bone fracture was not observed after 10 days practically. The synergetic action of peptides Gly-His-Lys, thymogen and dalargin may be used for stimulation of reparative osteogenesis. My lameness in the right hip is improving dramatically only one day after starting SAM-e 400 mgs and the 3% GHK-Cu cream mixed with 3% DMSO, rubbed over the hip area. I must be taking 15 assorted supplements by now, MSM, BioCell Collagen II, NEM, and CTMinerals among them, started a week ago, so determining exactly why this rapid improvement would be futile. However, the GHK-Cu cream and SAM-e seem to have accelerated things. Impressive relief from facing a saw-bone nightmare.